H264 WebCam Pro is a 8-channel h264 remote video surveillance software for Windows. It can capture images at up to 30 frames per second from directly connected cameras (both USB and analog), TV boards, capture cards, network ip camera etc. It can broadcast live audio and video to internet, and help you to create web page for your camera. This webcam software has an advanced video motion detection algorithm along with various alert functions including Email, FTP, and sound. It can encode your camera to H264 and AAC multimedia stream, and this stream can be viewed by Quicktime, Realplayer, IE browser on remote PC, Macintosh, Handset etc. This software also has a unique H264 User Name mode to manage dynamic ip address on the internet. High quality video and audio effects with low bandwidth needs and recording file formats include MP4, MOV, FLV, SWF or AVI. Manual recording is available, along with scheduled recordings as well as motion-triggered recording. JPEG image snapshots can be made from video images along with detailed log files. This software also includes its own help files. Other features include secure Login with a valid user ID and password required for network based access and it can automatically restore the network connection if the network link is lost during a monitoring session. This feature rich software combines a digital video recorder and digital video server making it possible to be used as a stand-alone product or the centerpiece for building a powerful surveillance network. Add Amovision IP camera supporting. 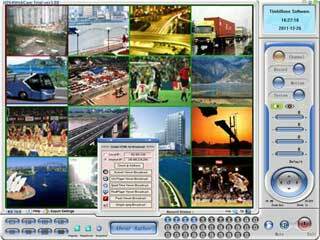 8-ch H264 remote video surveillance software. Record images up to 30 fps from USB cameras,TV boards,capture cards,network ip camera. Broadcast video to internet. Email,FTP Alerts when video motion. H264 and AAC encoder,record to AVI,MP4,FLV file. Server captures images from any capture devices including USB cameras, TV cards and analog devices, and then broadcasts the live video all over the network.Client receives the broadcasting and displays up to 9 webcams simultaneously. CamSplitter software allows to use one webcam device in multiple applications without locking the device. This software is designed to work like a bridge between one webcam device and several webcam software applications. H264, WebCam, WebCam software, video surveillance, surveillance, video security, security, monitoring, multiple cameras, camera, ip camera, alarm, email, record video, video recording, DVR, NVR, IP video, alerts, video buffering, broadcast 8-ch H264 remote video surveillance software. Record images up to 30 fps from USB cameras,TV boards,capture cards,network ip camera. Broadcast video to internet. Email,FTP Alerts when video motion. H264 and AAC encoder,record to AVI,MP4,FLV file.